SCUBA divers know how exciting it is to discover new and exciting creatures on the reef. What’s even better is when a buddy that’s new to diving finds something fun and has the opportunity to share that with you! What’s even better than that is when your wife gets the chance to make that discovery on a recent trip to Puerto Vallarta where we dove near Mariettas Island! I’ve included video of both dive days below as well as some thoughts about my experience shooting underwater with the GoPro. On Monday we did two boat dives around Mariettas Island. I also got the opportunity to snorkel to Hidden Beach, a small cove accessible only through a tunnel when the tide is low. These two dives were nice, easy dives with little current or surge. Time Index – You can view the video here or if you’re interested these timecodes are linked in the description if you watch the video on YouTube. On Thursday I dove on two sites called El Morro and Mojito. These small islands are not labeled on Google Maps what the heck!? Anyway, they are about where I marked them below. Both days we dove with Vallarta Adventures. The first day (Mariettas) we dove on a snorkeling/SCUBA tour and I will tell you that the crew (Vallarta Adventures Boat #1) worked hard to entertain and take care of us as passengers, tourists and divers. We were kept in reasonably small groups of four to six divers per dive leader which I was thankful for. The groups went in different directions or started on different parts of the reef so it never felt like we were on a ‘cattle boat’. Some of you more advanced divers may be cringing a bit at the thought of SCUBA diving with a tourist group. What I will say is that my wife and I were there to spend time with her sisters and diving was an added bonus. I figure any diving is better than not diving and this was more than that. The diving was fun, low stress and the reefs (especially El Morro and Mojito) were great! The water temperature was a balmy 88F so it was very comfortable. My single complaint… seriously everything else was great but… I tend to dive slow and I was always behind. Nine times out of ten I’ve found that you see more going slow than you do speeding around the reef. Lucky for me, while I say this was a complaint, this put us at the right place and time to see the manta ray (1:40 on the El Morro video). This was my first manta and the experience was magical. Magnetic Hose Clip – It worked fine. Better than a plastic clip for $1.99? Yeah, if you’re not a gear junkie you might save your pennies (IMO). I’m going back to Blue Hole, NM in a few weeks and I’ll play with it some more. UK Aqualites – If you haven’t seen these yet I highly recommend you get down to your local dive retailer and check them out. 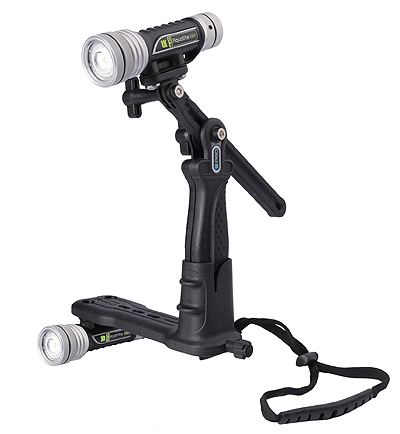 I used two of these (Aqualite Duo Lighting Kit) with my GoPro 3 Black and the lighting these provide is broad (90 degrees), bright, even and beautiful! Even with the handle and two lights the GoPro is so small and light that it takes a lot of practice to keep it smooth. Full disclosure here: I did have trouble with one of the lights and they were brand new – total bummer right? Having been around niche product manufacturing all of my professional life I am fully aware that ‘stuff’ happens. Underwater Kinetics (UK) totally made it right when I got back. I returned the one I had trouble with and they replaced it with no problem. My experience with them was spot on – my thanks to the team at UK! I’m looking forward to diving the new light on my system in two weeks and I’ll post the latest video with these lights when I return. Okay… insanely long post… no I’m not trying to make up for the distinct lack of posting lately just wanted to get all that out there for all my dive buddies out there!